All patients diagnosed with a sports hernia must complete a period of rest followed by 4-6 weeks of physical therapy. The majority of patients — if properly diagnosed — will have an excellent response to physical therapy and will not require sports hernia surgery. Physical therapy for sports hernia focuses on stretching the low abdominal and lower extremity muscles and tendons. In addition, strengthening of the core muscles is emphasized. Why? The mechanism or cause of the injury is due to an imbalance between muscles inserting on the pubic bone. Almost uniformly — the leg muscles are relatively more powerful than the core or torso muscles. Physical therapy helps to correct this imbalance. For more details on sports hernia treatment, please read Dr. Hoadley’s sports hernia repair protocol, developed with Cara Yano, MPT at Atlanta Sports Medicine and Orthopedic Center and Scott Kneller, the Atlanta Falcons PT, DPT and Rehabilitation Coordinator. Physical therapy may be augmented by an array of modalities such as dry needling, deep tissue massage or ultrasound therapy. In addition, XPRO GEAR Recovery Line offers compression shorts combined with FIRE (far-infrared energy). See sports hernia recovery wear for further info. The ultimate goal of physical therapy for sports hernia is to have the athlete performing pain free at full tilt. If this final goal cannot be achieved with physical therapy and rehabilitation, then sports hernia surgery may be required. Experience counts. Before sports hernia surgery is recommended, the athlete is assured of the proper diagnosis — sports hernia — and that non-surgical management has been offered and ineffective. Once these criteria have been met, then sports hernia surgery is reasonable. First, athletes are given a choice of anesthesia. Local numbing medication with sedation, regional or general anesthesia are the available options. Sports hernia surgery can be achieved with all three types so the method of anesthesia is a personal choice. Sports hernia surgery centers on stabilizing the insertion of the conjoined tendon at the pubic tubercle. In addition, a superficial nerve is removed. Why? This nerve can get caught up in post-surgery scar tissue and mimic symptoms of a sports hernia. Also, a thin, pliable mesh is placed by the surgeon over the repair and extends along the inguinal canal. Why? This further supports the sports hernia repair and strengthens the inguinal floor. The surgeon makes an incision 4-5 cm in length. Sports hernia surgery is done as an outpatient. Local anesthetics are liberally administered prior to closing the incision to cut down on post-surgical discomfort. The first week following sports hernia surgery, rest and relaxation are prescribed. During the second week, athletes are asked to walk on a treadmill for 20 minutes per day. The first follow up appointment is at two weeks. At that time, athletes are allowed to start post-surgery rehabilitation. The initial sports hernia surgery does not address discomfort at the adductor insertion site. If the conjoined tendon is adequately supported by the sports hernia surgery, adductor discomfort almost uniformly resolves with postop rehabilitation. Rarely does the adductor require operative release. For athletes who continue with adductor symptoms despite postop rehab or for those whose main complaint focused on the adductor – nonoperative options do exist. Adductor issues not responsive to rehab are often treated with Platelet-Rich Plasma (PRP) injection. PRP is an office based procedure which involves drawing a tube of blood from the athlete. The blood is spun-down and the platelet rich plasma is drawn out of the vial. Under sterile conditions and the use of local anesthesia, the adductor insertion is directly injected with the plasma and platelets. Post-procedure rehab is continued and rarely is a second injection required. This technique has nearly replaced operative release of the adductor insertion. At the start of the second post-surgery week, sports hernia rehabilitation begins. 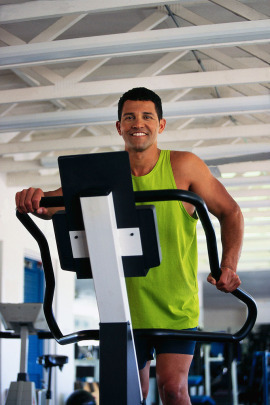 Athletes are instructed to walk on a treadmill for 20 minutes per day. Why a treadmill? Because there is less resistance when compared to the static ground and bars are available for balance. By the end of two weeks, most athletes are off narcotic pain medications and have done well on the treadmill. They are now ready to start post-surgery sports hernia rehabilitation in earnest. Post-surgery rehab is similar to pre-surgery physical therapy. Emphasis is placed on core stretching especially of the operative site. Core strengthening is slowly advanced as tolerated. Every athlete progresses at an individual rate. While post-surgery rehabilitation may take 8-10 weeks, the majority of motivated athletes can complete sports hernia rehab and reach 100% of sport specific activity in 4-6 weeks following sports hernia surgery.